We Americans think of baseball as our “national pastime,” and perhaps rightfully so. But it would be equally true to say that the Japanese have adopted baseball wholeheartedly, and made it their own. I know of no other Western sport with an authentic Japanese name, written in kanji (野球　yakyuu, or if you will, “plains ball”), with other authentic Japanese terms for “base,” “pitcher,” and so on. 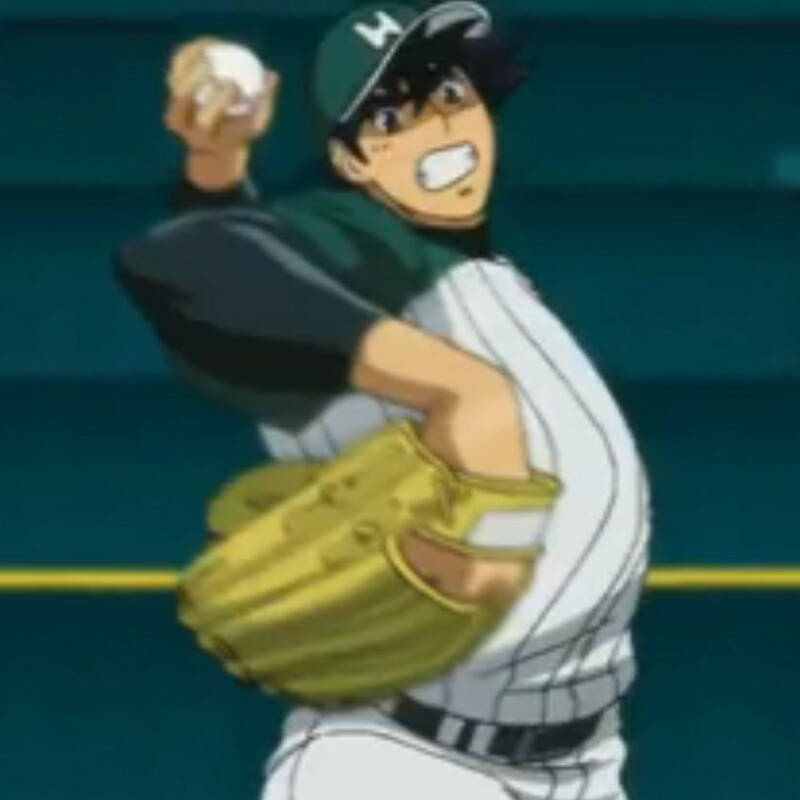 Amongst baseball anime, Major is unique in following the life of a single character, Honda Goro (later Shigeno Goro after his adoptive parents), from infancy through his late twenties. In a way, Goro is the simplest character you will ever meet. He has but one dream: to become a major league pitcher and play professional baseball in the US. He will face any obstacle, make any sacrifice, and push himself to any limit, to achieve this. Single-minded, constant hard work to achieve one’s lifelong dream: that is what this show is about. The obstacles in Goro’s path are many, but the result is the same for them all. Blow out your right shoulder when you’re just about to enter puberty? Then become a southpaw, and in the meantime tough it out. Have your luggage stolen upon arriving in the US to enter the minor leagues? Then thumb a ride at the airport, be rescued by coincidence (!) by a Japanese man, and in the meantime tough it out. The last obstacles are all within Goro himself, and they too must meet the same fate. Where does the “unknown God” within anime fit in with Goro’s life? Mainly, I think we see him enabling Goro to inspire everyone he meets to excel, on every baseball team in which he participates, from Little League to the major leagues. One such character is Sawamura Ryouta, elementary school delinquent, who soon turns his life around after meeting Goro. Or one could mention Yoshitaka Yamane, junior high delinquent, who when he saw how Goro had overcome a similar injury by switching dominant hands, stopped beating kids up and started playing baseball again. The roll call of changed lives continues through Mike Murdoch in the last season, who through Goro’s influence, changed from a liability to a valuable team member. Did Goro deliver on that challenge? I think so, but you’ll have to watch and decide for yourself. The 154 episodes of Major are quite a ride, but one well worth taking. Note: This post was written by R86, a frequent commenter on Beneath the Tangles. I hope you’ll look forward to future posts by R86 on this blog. R86 is a chemistry professor, which is the sort of job that probably made you stop reading already. He teaches at Texas A&M University, also known to Austin dwellers as "Enemy Territory." In his spare time, he enjoys music (flute/saxophone/clarinet and MIDI/Vocaloid synthesis), gaming, and watching anime. Japan can have baseball, it’s the most boring sport ever. Well…except maybe for curling. America’s true pastime is superior handegg. I would never have expected to enjoy a baseball anime either. What’s more, I too would rather watch a handegg game than a baseball game. But a character whose singleminded devotion to baseball (or replace “baseball” with whatever, and in anime they often have — “Hikaru no Go,” anyone?) inspires everyone he meets to excel also — that’s something different entirely. I wish I were that devoted to the things I claim to consider most important, or that much of an inspiration to people around me. To me, that’s the most important thing about “Major” — not the baseball. Nor is baseball the most important thing for me about “Ookiku Furikabutte,” aka “Big Windup,” which I’ll be reviewing later. And which is as different from both “Major” and “Cross Game” (reviewed elsewhere on this blog by our gracious host) as one could imagine. But yeah, as in most sports anime, it’s about the relationships (mostly), with baseball being the backdrop and the instrument to set events in motion. I am so excited that finally there is anime that “meets Jesus Christ”! May the Lord bless your work. If you are ever in Bryan or College Station, Texas, we would love to have you visit with the teens who love anime. Sounds like fun! I have two little ones, so it’s hard for me to travel outside of work (though I’m not too far from you), but I’ll certainly keep this in mind!